I’m thinking about time. A subject about which I am very dubious. I’m not sure I really believe in it. But earthly time, as measured in hours and days and weeks, does have its practical impacts. I now have a date for the removal of the pot – or cast, or whatever you like to call it – from my right (writing) arm. November 30th: an earthly day that cannot come too soon. Thus, whether or not I believe in it, time seems to be relative. 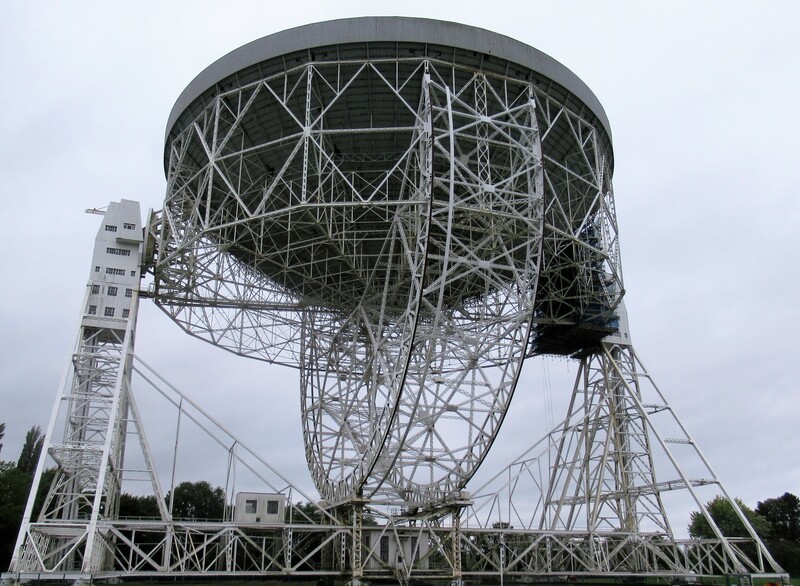 A theory supported by the evidence in this picture, taken at one of my favourite places, Jodrell Bank. 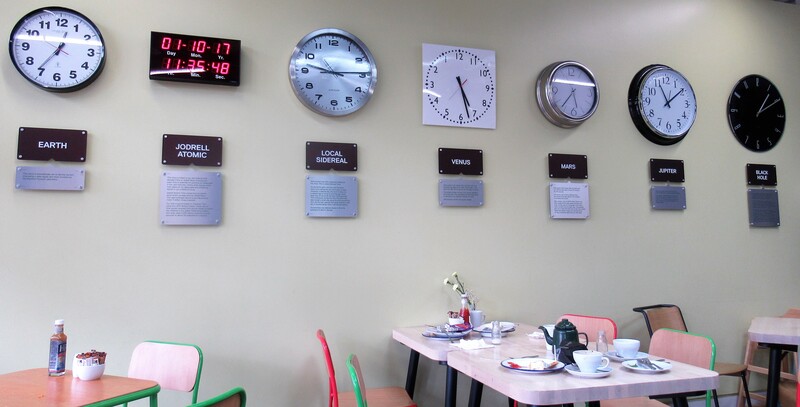 Where it’s either time – or not time – for a nice cup of tea and a sit down. A chance to ponder the meaning of signals from outer space – and the probable dearth of leaf tea in a black hole. 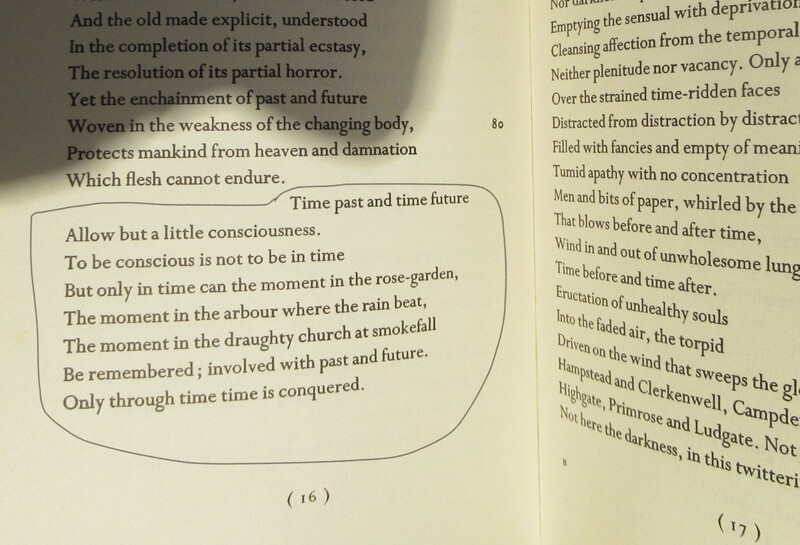 Some final words now – if it is now as you read this – on time past, present and future, taken from the Four Quartets. Because TS Eliot describes how I feel (fleetingly) about time better than I ever could. For this I forgive him for measuring out life with coffee spoons (The Love Song of Alfred J. Prufrock), when it should, plainly, have been teaspoons. And he was, after all, born American. This entry was posted in Britain now & then, Thinking, or ranting, or both and tagged black holes, coffee spoons, Jodrell Bank, outer space, radio telescope, tea, teaspoons, Time, TS Eliot. Bookmark the permalink. Thank you for the Eliot quote (and reassurance about the virtual pencil). The issue of time fascinates me. As you gracefully point out, time is relative to location and in memory. But I’ve also learned that it is relative to age, seeming to pass faster as I grow older. 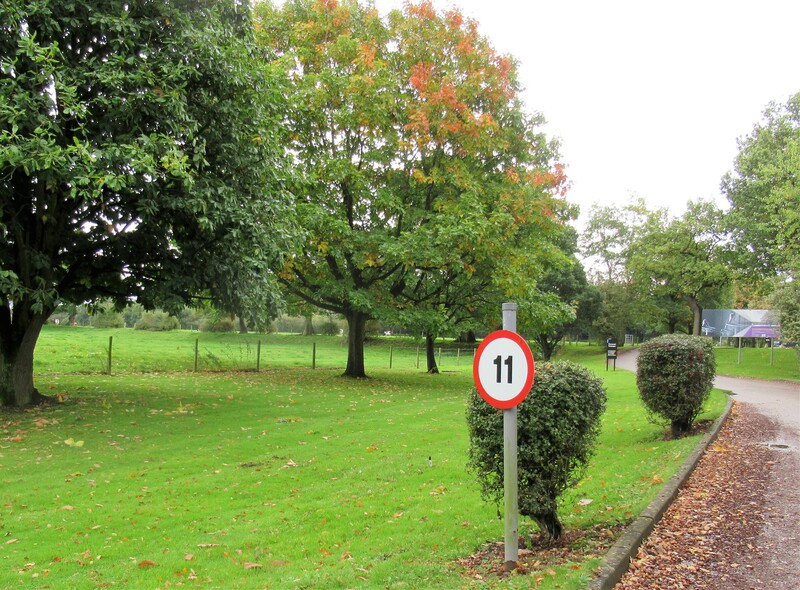 I’ve read that the sense of speed is relative to lived experience of the passage of time. Physics tells us time is not likely to pass faster for one person than another, if they’re in the same physical place. I’m not so sure. Perhaps the illusion is that time is quantitative–fixed and measurable rather than subjective and relative. It’s too deep for me. Thank you for the provocative nudge this early afternoon (the time here, relatively speaking). 🙂 That’s the best I can do as a relatively pleased face! Glad you found it thought provoking. I like what you say about subjective and relative, that sums up how I feel about time, I think… probably! I have similar experience as Miz B. I went in search of answers -to that place everyone goes Google!- as my time passes time passing seems to be speeding up for me, to which the G.O. concurs, with some anomallies… e.g. Tuesday morning classes with a teacher who has great affection for his own voice! Thanks for the TS Eliot, and the note re the pencil… I did wonder! I don’t take sugar, so neither coffee nor teaspoons for me, maybe wooden -cooking- spoons which doesn’t have the same ring to it. November 30 also is my last day of Tafe, after which I’ll have a little more free time -for 2 months-than currently. I wonder if our collective anticipation will speed up the passage of time or slow it. I didn’t even like virtually scribbling on my book! But it has just popped up as an option in Windows so I thought I’d try it out. As a child I used to ‘draw’ ahem on some of y books – it is great to scribble and then erase, no damage done! Time seems to telescope…the Nelson sort of telescope rather than that of Jodrell Bank. One minute it is stretching out before me…then it has collapsed an event into seconds. I enjoyed the Eliot, thank you. Glad you enjoyed Mr Eliot’s words. And I know what you mean – some days lately have been endless, others, where did that go? The former largely on the days when the Prof leaves the house at 7.30 and I don’t go out or see anyone till he gets back at 7 or so. But now I’ve been to the bookshop – I doubt they’ll be long enough! Ah yes, removing the plastercast, remember it well. Don’t be alarmed at the circular saw, makes a lot of noise and the thought of the blade spinning fast a millimetre from your delicate skin can be alarming. Imagine what it’s like to have one on the whole arm for eight months, when you’re desperate to be rif after one. Time: One argument states that time is the only reality, that we exist at a point in space and the only change is time flowing past us. You are bonkers, you know that? 😉 Isis and the world’s biggest necklace. I didn’t realise you were disarmed for so long! That’s a case of time being relative, I’m sure if felt much longer to you than it did to us bystanders. Time: not sure if I like that idea, but it’s as good as any other I’ve heard or read. I bet it’s been used in Doctor Who somewhere along the way. Is it not curious that in these post Einsteinian days the scientific idols talk endlessly about time as if its all laid out in the absolute sense. The tell us just how old the universe is and even talk about what happened in the first millionth of a second ; then they go on to be very explicit about distances in light years and end up by talking about the half life of radio active materials with great accuracy. I’ve got a suspicion that like the rest of us they inhabit a Newtonian universe . Exactly! Oh hang on, do you really think we inhabit a Newtonian Universe???? Well I read the word press site rationalizing the universe; mind you often my eyes glaze over and the words churn through the brain without effect. The two physicists who created the site are in the process of rescuing objective time using quantum mechanics , they claim in their latest blog that both the relative and the objective views are acceptable at this moment in time( no pun intended). I expect you know the thought experiment where an identical twin goes off at near the speed of light and returns to find his brother twenty years older where as he is but a year older. Not at all you present much of interest and a lot to mull over for any who care to read it thoughtfully.